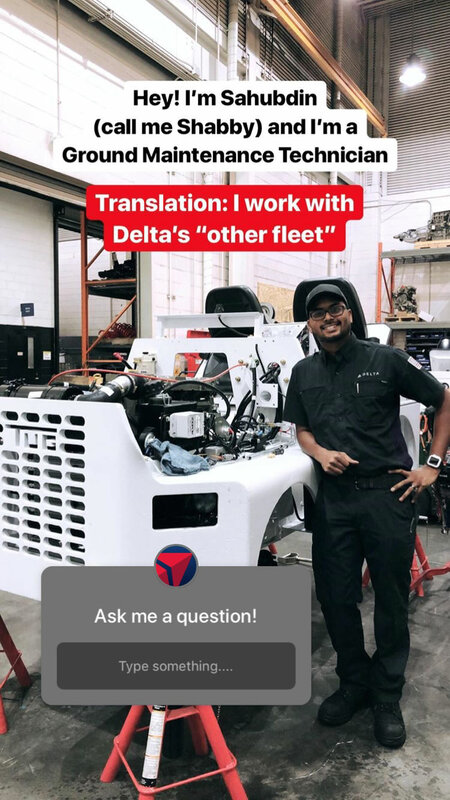 Sahubdin Fazal (Shabby), a Ground Maintenance Technician, took the world behind-the-scenes at Delta's Ground Service Equipment facility in Atlanta. Not only that, he allowed Delta's Instagram followers to ask him questions in real-time using the platform's new questions sticker for Instagram Stories, which were then answered publicly in a subsequent post. "Part of our strategy on social media is focused on sharing Delta Proud moments through our very own employees," said Ryan McFerrin, General Manager — Marketing Social Media. "The direct connection between various work groups and our customers through these Q&A's is a great way of bringing 'No One Better Connects the World' to life." Delta's followers were quick to engage. Inquiries ranged from "What's the biggest piece of ground equipment Delta has?" to "How long have you worked for Delta?" It gave a comprehensive look behind-the-scenes of both the facility and technician. The story went live on Delta's Instagram Story on August 1, at 11 a.m. EST and has already received over 93,800 views. The series will feature a different employee group once a month allowing customers to get an authentic view of the people behind the operation. Follow the Delta Instagram page to see future iterations.